Healthcare REIT Welltower has been in a slump lately. Here's why long-term investors shouldn't worry. In the week since Donald Trump won the presidential election, the stock market has soared. However, real estate investment trusts, or REITs, have been an exception. One of my favorite REITs, Welltower (NYSE:WELL), has continued its recent decline and is now down nearly 20% over the past three months. Here's why long-term investors shouldn't be worried. Why REITs aren't getting a "Trump rally"
In a nutshell, REITs get crushed when interest rates rise rapidly, which is exactly what happened after the election (the spike in the orange line in the chart below). And as you can see, the real estate sector and interest rates tend to move in opposite directions. There are two main reasons for this. Most obviously, higher interest rates mean higher borrowing costs for REITs, which generally translate into lower profit margins on acquired properties. 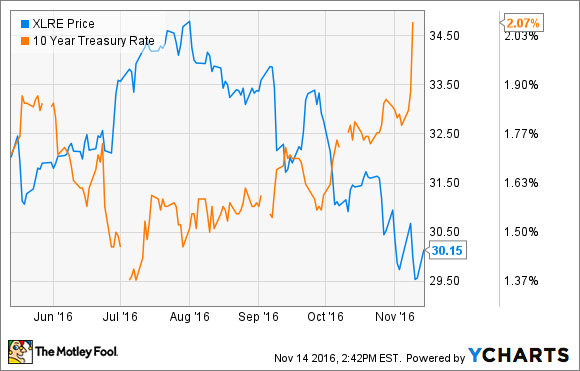 In addition, rising interest rates make lower-risk investments like Treasury bonds more attractive. Think about it this way: If a Treasury bond pays 3% while a high-quality REIT pays 5%, the REIT might be more appealing. If they both pay 5%, this may not be the case. For this reason, rising rates creates selling pressure on high-dividend stocks like REITs. However, while the decline could certainly continue, I still feel high-quality REITs are a fantastic long-term investment. In Welltower's case, there are some compelling reasons to hang on. Welltower has grown tremendously throughout its 45-year history and is now the sixth-largest U.S. publicly traded REIT, and the largest specializing in healthcare. Despite this fact, there is plenty of growth opportunity ahead. For one thing, the healthcare real estate industry is highly fragmented. No company has more than 3% of the $1 trillion U.S. healthcare industry, and the market is still in the very early stages of consolidation. In addition, Welltower has recently expanded into international markets (the U.K. and Canada), and has done so aggressively with $5 billion of investment within just a few years. Finally, the demographic trends point toward rapid growth in the healthcare industry. The population is aging rapidly, with the 85-and-above population in the U.S. expected to double in the next 20 years. In the U.K. and Canada, the elderly populations are increasing five and seven times the rate of the general population, respectively. This translates into more demand, especially for senior housing, Welltower's bread and butter. Plus, older people spend more on healthcare. The average U.S. resident in the 65-84 age group spends more than double the national average on healthcare, and the average person aged 85 or older spends nearly five times the average. In other words, we're talking about rapid growth in the most lucrative part of the market. Image source: Welltower 3Q16 investor presentation. Along with its third-quarter earnings report, Welltower announced a major portfolio repositioning, which includes $3.3 billion worth of dispositions, set to take place during the fourth quarter. There are a few reasons for the shakeup. For starters, Welltower has been actively increasing the concentration of private-pay assets in its portfolio over the past several years, and this will help boost it even further. Private-pay healthcare facilities, as opposed to those dependent on government reimbursement, tend to be more stable and predictable. Capital markets are strong, and there has been a high investor interest in healthcare real estate, so Welltower decided to do its repositioning now to get maximum values for the properties it intends to dispose of. More significant than the repositioning itself is the company's willingness to evolve and adapt to changing market conditions, and the desire to actively pursue the best possible portfolio to deliver strong and consistent returns to shareholders. In addition to the reasons mentioned above, the repositioning will reduce the company's leverage ratio from 39.5% to 34.4%, which will strengthen the balance sheet and add to Welltower's financial flexibility. The company has already made excellent progress toward a better financial condition over the past few years, and the repositioning will allow this improvement to continue. Once the repositioning is finalized, Welltower's fixed-charge coverage will rise from 3.4 times to 3.6 times, debt-to-adjusted EBITDA will fall from 5.7 times to 5.1 times, and roughly one-fourth of the company's enterprise value will be made up of debt. Welltower currently has a strong credit rating (Baa1/BBB+), but I wouldn't be surprised to see it improve further in the coming quarters. As a final thought, consider that Welltower has a 45-year track record of delivering excellent performance. Since its inception, the company has generated 15.6% average annual returns and has increased its dividend by an average of 5.7% per year. With strong FFO growth, opportunities for further expansion, a solid balance sheet, and perhaps most importantly, a willingness to evolve and adapt, there's no reason to believe Welltower can't deliver market-beating performance over the next 45 years.